If you’ve ever covered something like a school board meeting and thought, “There’s no way I can make this interesting,” let Linda Lutton prove you wrong. 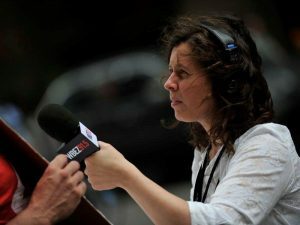 This post is based on a Third Coast Festival presentation she gave at the 2015 PRPD conference about how to infuse documentary-style radio into everyday reporting (even when you think you don’t have the time or material). Think about a place it makes sense for you to tell this story. Go there, turn your tape recorder on. Do this for spots as well as features. LUTTON: As quickly as the leader could be removed, someone else took up the chant. I sometimes think about the words used in children’s books — the way children’s authors move action forward for kids, the way they heighten drama over things like shoelaces being untied. Those tactics work in radio too. LUTTON: For nearly two completely surreal hours, Chicagoans mad at 10 years of school closures stepped up to the podium and spoke to empty chairs. It was zany — protesters pleading with invisible school officials for their voices to be heard. Incorporate mystery and suspense — especially if these were present as you were reporting. For instance, in this example from the school board story, the “tick-tock” way the story is told makes you continually wonder what’s happening, and what will happen next. Also, even if you can’t turn your entire report into one big story, there can be little stories buried in a larger report. Life presents these constantly. Be on the lookout for them. Documentary film and radio are packed with these elements. We can add them to news reports as well, even spots. Think of yourself as a reporter, but also as a poet or artist (who is, of course, following all the rules of journalism). Consider taking what would normally be a single scene or a single character, and make that the entire story. Lots of daily news features “take us there” — but unfortunately, most quickly leave. Scenes are used at the top of the piece simply to add color. We lose an opportunity to show or explain or tell a story. The day Chicago announced the names of the schools it wanted to close in 2013, I stopped by Manierre School and met parent Karlyn Harris. I broke the news to her that Manierre was on the chopping block. It was her initial expression that made me think I could build a whole story around her. I talked to her in the school foyer for about 15 minutes because I wasn’t allowed into the school. Looking back, I can see now that this one mother at this one school in a 15 minute conversation hit on every major issue the media would deal with over the coming months, as the city debated the proposed school closings. Her story includes powerful metaphors. She said she felt the school closing is “like a mother’s kids being taken from her.” And she describes the school, across the street from a housing project, as an extension of home. HARRIS: It’s like, when you step out of your house you’re right into this school. So it’s like you’re stepping out of your bed and you’re going into the dining room somewhere. Tell me what happened, the news of the day. But also tell me, where possible, what that says about this place and its people. How this place functions, who’s on the inside and who’s on the outside, how people feel here. As reporters, we are holding up a mirror to society. But it’s not enough to describe the face we find there. We have to describe what the face reveals as well. See deeper than just the superficial. The Harris story gets at those deeper questions of what it feels like to live in this place, from her perspective. LUTTON: She does not feel good about the odds. That has to do with a lot of things, things that go far beyond enrollment numbers. HARRIS: We’ve been going to the meetings they have, but, it’s like they give you so many minutes to speak, and the panel sit up there and, you know, look at you. The people’s that on the panel up there, when you go to these meetings, they don’t have kids in these kinds of schools, these schools that they’re trying to close. These are blacks and Latino schools they’re closing. The media tends to herd. Don’t follow. Don’t be afraid to take your focus off the main subject for a minute, because sometimes you can say more about the main event by looking slightly away. Here’s an example of a powerful story I found by turning the camera. Chicago gun violence is usually covered through cops and victims; looking at it from a high school principal’s eyes turned out to be moving and impactful. You can do this with smaller news items too. Here’s a spot I did the weekend Chicago hosted the NATO summit in 2012. I was a general assignment reporter for the day. When I went out to do the story, I turned the camera. HOST: World leaders have been traveling from O’Hare Airport downtown in motorcades along the Kennedy Expressway. WBEZ’s Linda Lutton found some Chicagoans with a good view of the action. There are scenes in your own mind that are playing out as you report, and there are scenes in other people’s minds. Get to these invisible pictures and thoughts as well — dig them up the way you would dig up other facts. What are you thinking about/feeling when you do that? Here’s an example of a scene from my own mind, from a story I did about looking for kids who’ve dropped out of school. On tape, I visit a wrong address the school had on file. LUTTON: I imagine all the letters that Robeson High School has sent to this parking lot, certified letters, warning Tim’s parents to send him to school. LUTTON: Robeson’s principal is usually outside after school, which is when the fights tend to break out. He told me once he wishes it would rain every day at dismissal, so kids would go straight home. A principal wishing for rain every day at dismissal is visual, poetic, powerful. Write from memory (at least initially), rather than logging tape. Ask yourself: What happened? What do I remember most? Be sure to write in the details you remember about smells, sounds, expressions, etc. In the field: whenever something good happens on the tape, start a new track. Meaning, record a new file. That way your good stuff will always be at the end of each sound file. Snap simple photos or video for your own notes. Use this to write. Look at expressions. Look at interactions. Look at what people are wearing, where they’re standing, etc. Use “The Quest.” This is a storyline that already exists and can be superimposed onto anything. It involves you looking for something or someone — a person, an answer, etc. Check out this post for some other ideas about how to frame your story. Linda Lutton is an education reporter at WBEZ in Chicago.